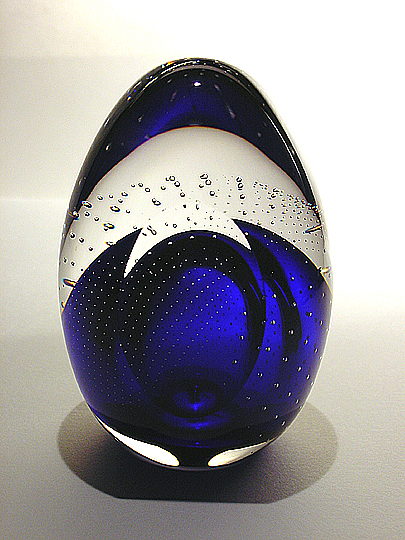 Although I was on a mission to acquire one of Josh Simpson's planets, I really liked Michael Trimpol's ovoid forms in glass. In particular, I really like the uniform grids of bubbles contained within the glass... these grids are made by pressing a custom implement similar to a florist's frog (a bed-of-nails-like device that goes in the bottom of a flower vase) into the molten glass. When the frog is removed, a small indentation remains in the glass. Adding a gather of clear glass causes bubbles to form in a perfect grid pattern. There is also a flat lens in the front of the bubbleweight which provides a sort of magnification effect when you look through it.